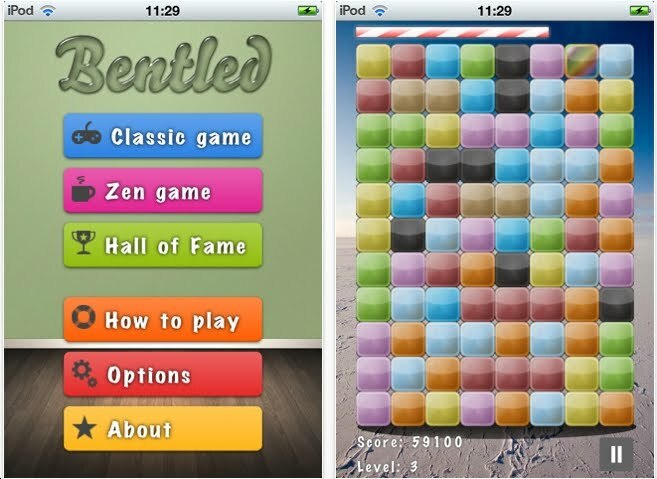 Are you a fan of Bejeweled? 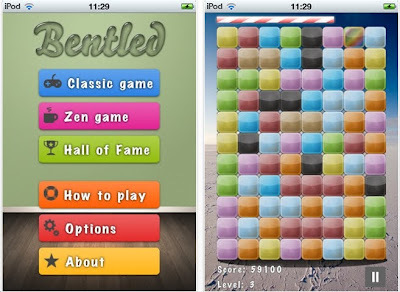 If so, Bentled is a good variation. The object is to score points! Drag rows & columns to get groups of 4 or more of the same color together. The bigger the group, the bigger the score. Black tiles must form a group of 8 to be eliminated. Luis Medel is the creator. In the last month, about 25 people have emailed me to check out Ancient Frog. 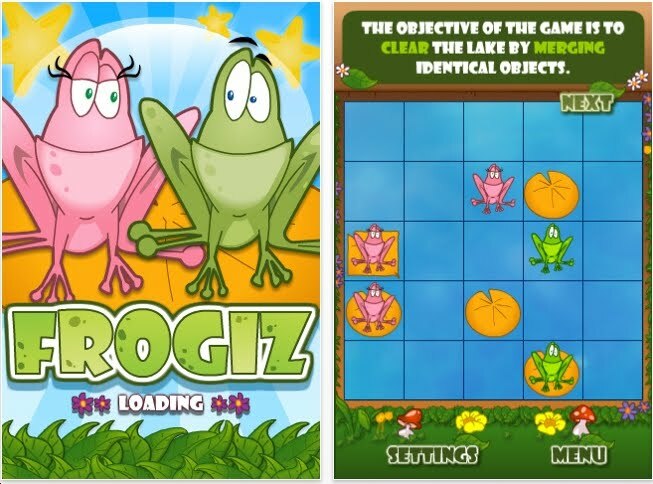 The object is to move the frog to get the fly, which is stationary. Move the frog - one leg at a time. The first dozen levels are quite easy. 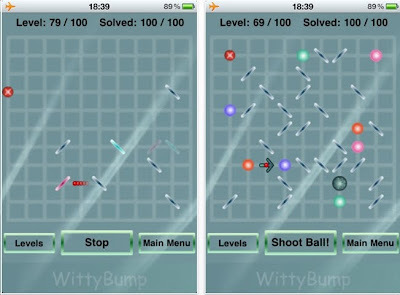 The harder levels require all sorts of twists & turns. Imagine trying to turn your car around in a narrow alley, but you can stretch your car along each wheel at crazy angles. 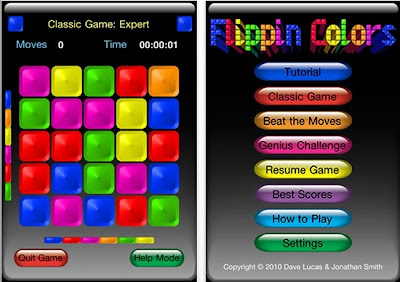 I am not compelled to solve each of the 100 levels. 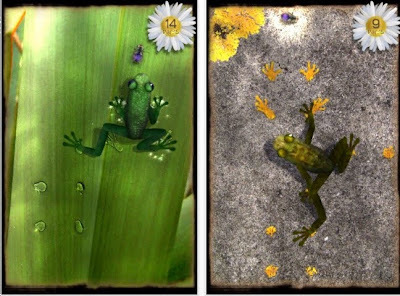 So I cannot say that Ancient Frog is a great fun puzzle app. But I do recommend that you download the free version and give it a test run. Keep the email recommendations coming! This is not the 15 puzzle. But the objective is the same: get the numbers in order. Click on any arrow and watch those numbers rotate clockwise. This puzzle is not new. I recall seeing it on a Nokia cell phone maybe 5 years ago. 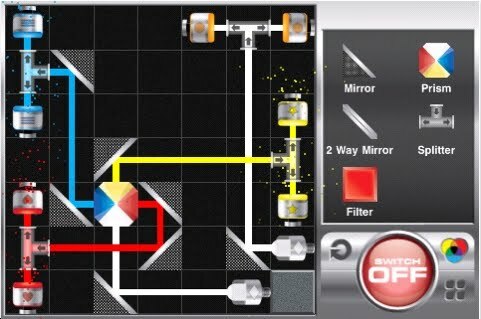 This would be a better puzzle if there were more features. Example: how about a 2x3 grid where the numbers rotated. Or: tap on 1 number and the surrounding 8 numbers rotate. If you're a fan of the 15 puzzle - give it a try! The puzzle reminds me of The World's Hardest Game. The object is to move the bright object from point A to point B without touching any of the lines. But here's the catch: you control the object by first pressing down on another object and moving it in the opposite direction. I solved the first 6 levels. Cannot possibly do level 7. 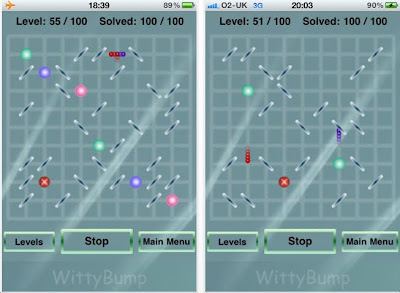 However, I recall a few years ago getting stuck on The World's Hardest Game at level 25 - and yet other people did those levels. Good luck! Downloading this app is free today! All right boys & girls, I couldn't stop playing Boxed In. 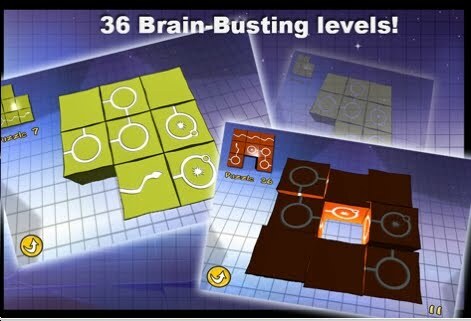 I completed the 50 levels in about 3-4 hours - riding the subway, eating breakfast etc. Not terribly hard - but fun! So, at the very least, this is the best fun puzzle app of the week - so far. As I said in my previous post, Boxworld is the true challenge. Are you a fan of sokomind or boxworld? If so, you know that you can never push a box into a corner to solve any level. Boxed In sometimes requires that you push a box into a corner. The object is to get your man to the exit while picking up the gray tokens. Notice the blue square is blocking the exit. You must move a box onto the other blue-outlined square first - that makes the blue square blocking the exit disappear. .99 for 50 levels. I solved the first 20 levels in about 1 hour. As a huge sokomind fan since 1995 - this is an exceptional puzzle app. Fun & brain provoking. We look forward to future puzzle apps from Dennis Mengelt. Martha Stewart will have Will Shortz- NY Times Crossword puzzle editor. Also Richard Garriott - mechanical puzzle collector. The object of Block fill is to fill the grid with rectangles and squares. Each number must rest inside one of those rectangles and there must be exactly that number of squares inside. 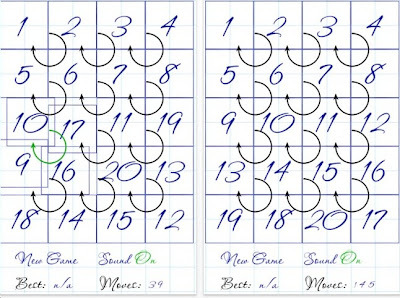 I first saw these puzzles in print form from Nikoli - the Japanese puzzle book publisher in 2001. They're fun! 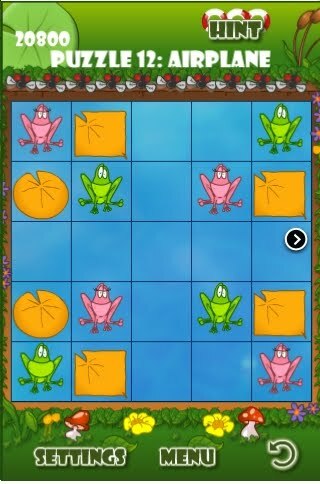 I've been playing the 10x10 grids. 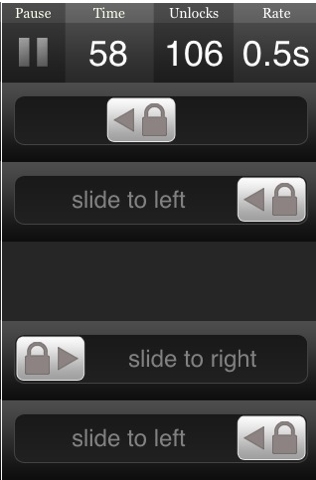 A bit small for the ipod/iphone. Perfect for the ipad. Each puzzle takes about 1 minute to solve. Right now the app is free! Download it. About 2 weeks ago I talked about Witty Bump. 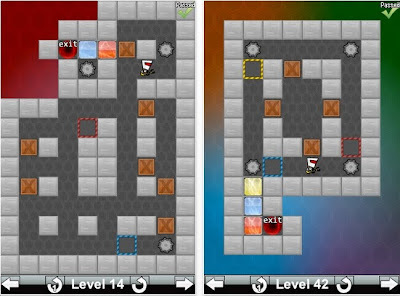 It's a maze puzzle with bumpers, wormholes and splitters. I just completed all 100 levels and the image above was my reward. 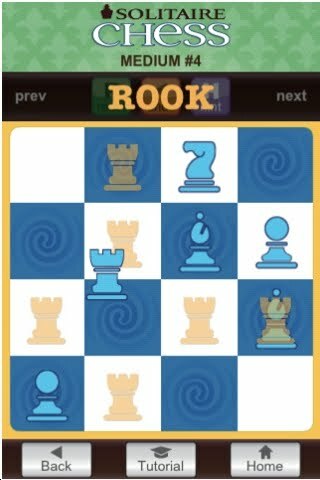 Whatever puzzle app you try - please rate it! This will help ensure that the good ones get popular. Is Witty Bump the best puzzle app? No. But it's fun and challenging. .99 provided about 3 hours entertainment on subways & planes. 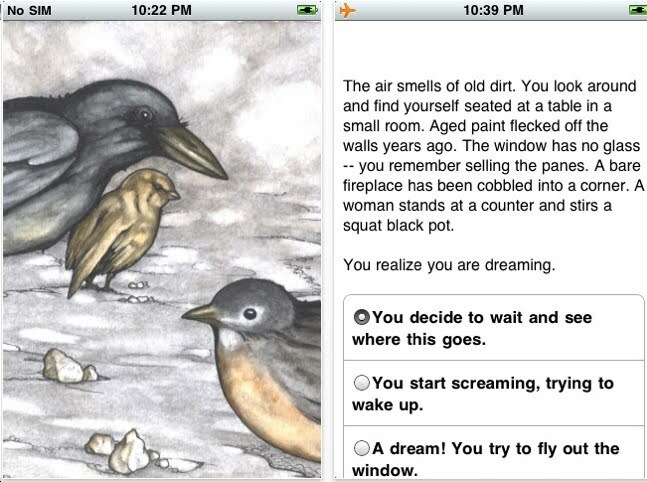 Alex Livingston created this very strange, dark twisted little tale. Answer correctly and you will increase your lucidity and insight. If your fear gets too high - back to the beginning. Not the best puzzle app. Not even a good puzzle app. But you may enjoy a text puzzle, so I'm informing you. At least the app is free. Gear Shift is the creation of Bram Cohen & Oskar van Deventer. The official description: Gear Shift is based on an idea by Bram Cohen. 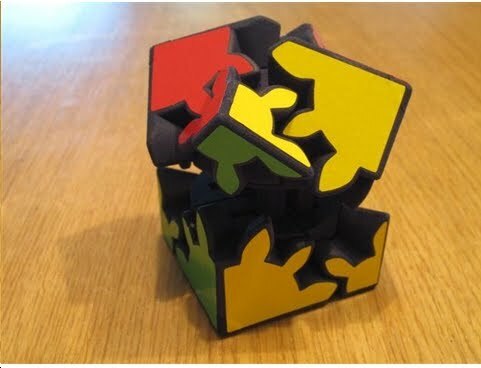 This puzzle has eight gears around a cube. All gears can turn together. But it is also possible to pull the gears apart in two sets of four. Each set of four can be turned individually. And there are three ways to split the gears. The object of this puzzle is similar to Rubik's Cube: scramble it and then try to solve it. Yesterday, I toyed with Gear Shift for about 45 minutes. Came up with an idea, implemented it & solved the puzzle. I do not fully understand this puzzle's mechanism. Just yesterday(!) I was telling somebody that I'm not a fan of rolling cube puzzles. But now, I've played Flup. 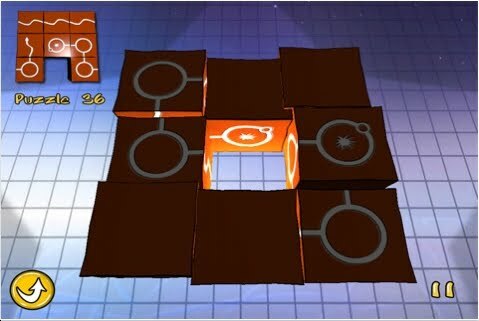 Flup has is a rolling cube puzzle with 2 types of moves. 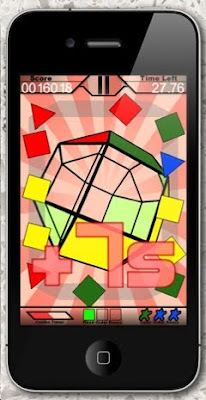 A cube can be either rolled onto another square, with a new face on top (swipe your finger). Or, it can be shifted to a new square without any rolling (double tap it). Download the free version & test it out! Years ago, this Mechanical Puzzle Correspondent was a chess fanatic. Then lost interest. The object of Solitaire Chess: every move must involve a capture of a piece. The puzzle is solved when 1 piece remains. My friend from Finland Vesa Timonen created this. Still I must remain objective. Solitaire Chess is compelling fun! Buy the full version with 400 puzzle challenges. I've solved about 325 of them. All the easy ones are done. 1 medium puzzle should be reclassified as impossible! Several years ago I bought a Nintendo DS in order to play a set of puzzles called Prism. 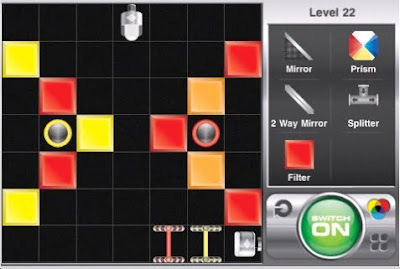 In the last couple of years this Puzzle App Correspondent has seen several versions of Prism in the App Store. However, the graphics were very disappointing. Download Lumi. 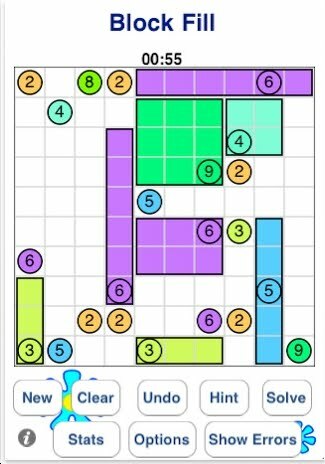 Try the free puzzles. Chances are, you'll buy the level packs too. Please comment, after you've tried it! 10:45 – 11:45 Lecture: The Making of a Virtual Puzzle by Robert Stegmannhttp://home.comcast.net/~stegmann/halloween/index.htm Please explore the link beforehand. 2:00 – 3:00 Puzzle buying/selling/trading We all have unwanted puzzles that another puzzle collector would treasure. Bring them! Note: the NYPPS is now by invitation only. If you would like to attend, shoot me a note. Geo Spin is not exactly a puzzle. Object: spin the polyhedron around and try to find the matching shapes/colors for each face. Definitely fun. We don't often see funky polyhedrons! 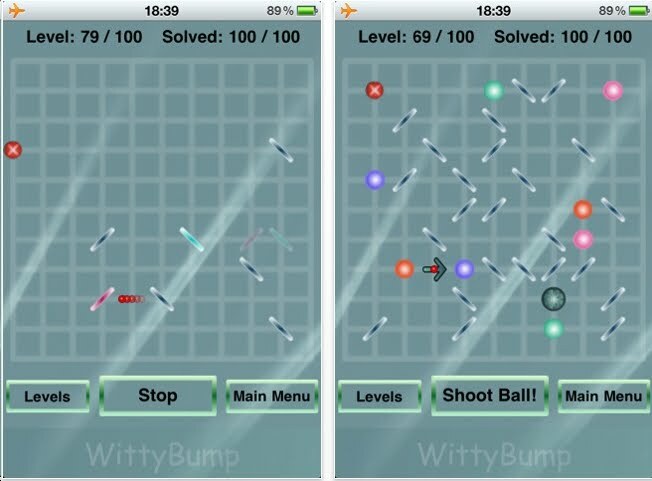 Witty Bump is a maze with bumpers, wormholes and splitters. Object: shoot the red dot into the X. If the red dot enters a blue circle, it will exit the other blue circle - that's one wormhole. Also: each of the bumpers can be reoriented but not moved. The big gray circle - not in all levels is interesting! If the red dot enters the gray circle from the top, 2 dots will emerge from the gray circle from the right and left and both must hit the big X.
I'm on level 75 - after playing about 2 hours. 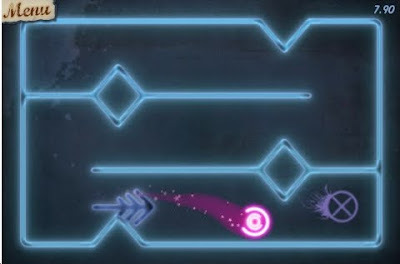 None of the levels is particularly hard. But it's definitely fun. Jonathan Smith has created this very interesting puzzle. Object: get grid to be 1 color. Drag your fingers along rows and columns. They will change to another color following a specific formula. The easy puzzles are very easy. The harder puzzles.....are hard! A few years ago I wrote an article for Games Magazine about Doug Engel's Circle Puzzles. 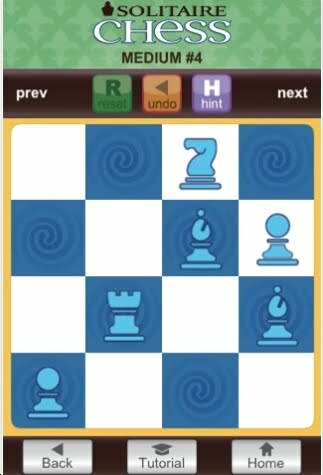 I detailed how to tackle sequential movement puzzles using trial and error by going through a sequence of moves and recording what changed and what stayed the same. That's how to tackle Flippin Colors. 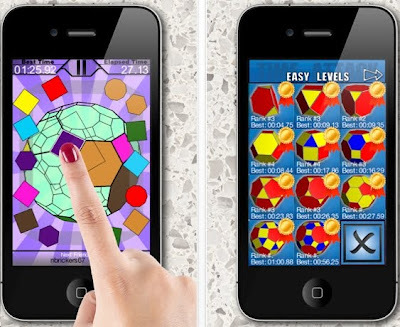 There's been an avalanche of puzzle apps. 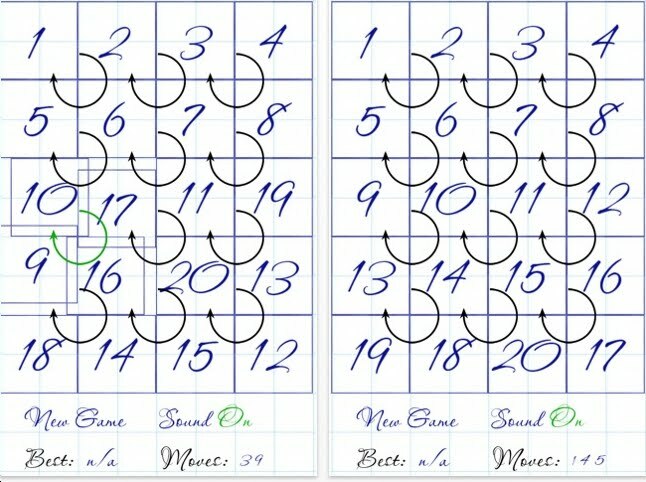 Many are variations of the 15 puzzle & sudoku. However, this is a puzzle that you can sink your teeth into & wrestle. We look forward to future puzzles from Mr. Smith. 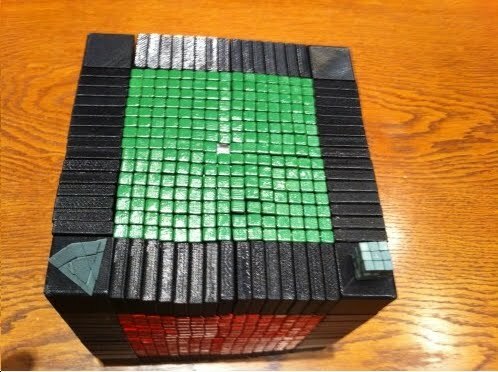 Yes, this is the famous 17x17x17 cube puzzle. Invented by Oskar van Deventer and made with the assistance of Shapeways. Oskar will formally introduce the puzzle at the New York Puzzle Party Symposium next week. Frogiz is a puzzle masterpiece. It is similar to a peg jumping puzzle. However, matching items must land on each other to disappear. If a pink frog is on a round lily pad, another round lily pad can move to that square: both lily pads will dissolve while the frog will remain. 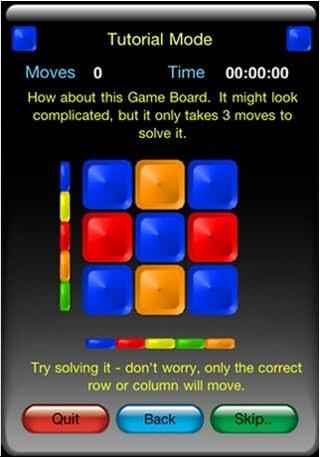 Haim Shafir http://www.shafirgames.com/index.php?lang=en is the genius behind this simple, yet complex, puzzle.